When the doctrines of faith and science meet, many view it as a collision of opposite ideals and extremes – I see it as a beautiful waltz of 2 distinct ideals with more in common than people realize. Many don’t think they can co-exist! I happen to believe they don’t simply co-exist – they were “made for each other”. Dr. Ben Carson was once drilled in an interview on NBC about his faith with the assumption that it was a direct conflict with science. He laughed mostly, but the words he did say that caught my attention were these. “I find a very good measure of correlation between my religious beliefs and my scientific beliefs… for those that struggle with this, I’m more than to discuss with them why they believe what they believe, and why I believe what I believe.”. I love his willingness to discuss why he can be a scientist and a man of faith. I know people struggle with this and if you’re not a fan of Dr. BC and hate that I started with a quote from him… chill out. This post is not about Ben Carson. The fact is Faith and Science go together like Garrett’s specialty popcorn in Chicagoland. 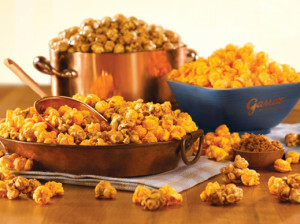 A unique mix of caramel & cheese popcorn! It shouldn’t go together… but THEY JUST DO! (If you haven’t experienced this awesomeness – you can order some online today). Here are just a few reasons why I believe that Faith and Science were made for each other. 1. The Christian Faith has a Foundation that Encourages Scientific Exploration. What most people fail often to recognize is that our faith should inspires us to learn, explore, and figure things out. If you believe that God created everything, and gave men and women dominion over everything that was created – then you understand that God WANTED us to explore this earth. Create from what was created. Find out how things worked and understand how to take things further. Every scientific formula and creative expression falls in line with “Hey Adam, it’s all yours. Dig, Mine, split open, mix together, climb, soar, fall, try again! Find out what works and doesn’t work. I’ve given it ALL to YOU to EXPLORE!”. God doesn’t FEAR our scientific exploration – HE CREATED IT! 2. Faith is involved, no matter what your Hypothesis or Conclusion. Take the beginning of everything for example. The fact is, you and I weren’t physically present when everything came into existence. So whether you believe it was accidental, chaotic, a big explosion that has evolved over time, or was intentionally created by a Creator – every aspect of science requires belief (faith) to carry it to it’s desired end in our minds. We always fill in the gaps – somehow. Albert Einstein landed on the X-factor when he began to work through his equations because He simply could not piece everything together without acknowledging that there is something that holds the science together, something that that made it all work. God is as active in the work of science as He is active in the spiritual and emotional parts of our lives. Every aspect of science requires belief (faith) to carry it to it’s desired end in our minds. 3. Science helps Falsify and Verify our Religious Assumptions. When science tells us that something (the earth, a tree, a canyon) is a million years old, I don’t fully disagree. God gave us the trees and the earth with ability to mine, measure, and do our best to calculate these things. I’m an young earth creationist (I believe everything was created with age built in) so it verifies my assumptions. Years ago, people would pay high premiums for brand new furniture or jeans that look “distressed” (antique/old looking) – so this concept is pretty easy to understand. World devastating events like the continental drift? I happen to believe there was a literal global flood when God destroyed everything (save a big boat that Noah built). When something is discovered that might falsify what I’ve believed, it takes me back to see WHY I believe that. What assumptions have I made and what does the bible actually say? The bible wasn’t given to us as a science notebook, so I don’t expect to find all of my answers in there. The bible doesn’t address GRAVITY, but I believe it! Don’t be afraid to allow science to verify what you understand to be true and what you may have possibly just assumed to be true. Science was given to us by God to test, try, and prove what He already knows and we have the incredible joy of getting to discover. Where have you struggled to fit science and your faith together? Do you believe the contradict each other – or confirm each other? This is a good take on science and the Bible.